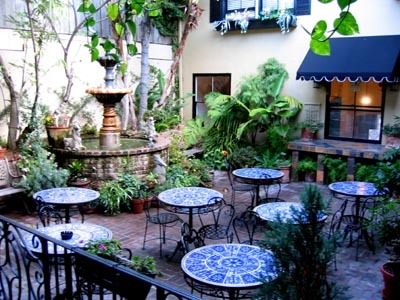 The courtyard in the Eiler’s Inn where breakfast is served, an herb garden grows in pots. The courtyard is peaceful to hang-out in. 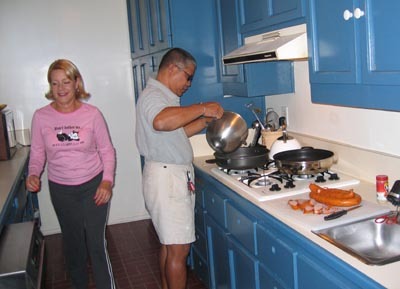 Chaz and Linda are up early and starting to prepare breakfast for me and the other guests at 7 a.m. Here’s Chaz pouring some eggs in the pan as Linda sweeps through also preparing food, silverware and other goodies for breakfast. 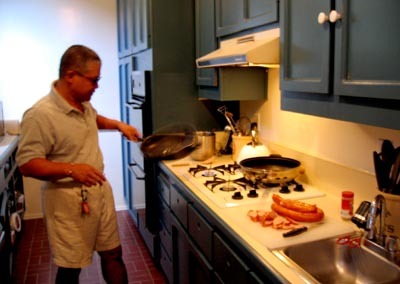 Chaz works on scrambled eggs for breakfast. 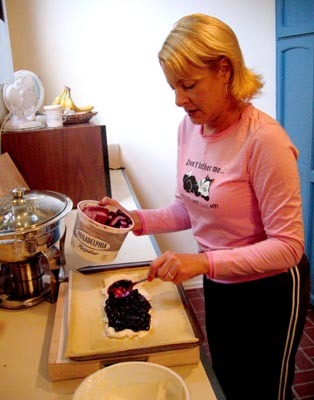 Linda works on putting together a cream cheese and blueberry strudel for breakfast. She popped it into the oven and it was delicious for breakfast. 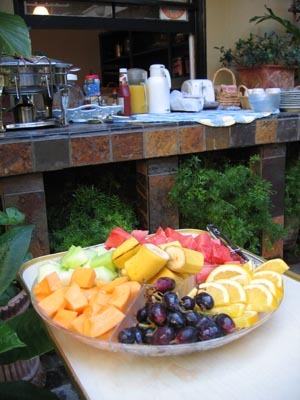 Breakfast is fresh fruit, Kona Coffee, toast, scrambled eggs, sausage, blueberry cream cheese strudel and various cereal, tea and other stuff is available. As usual the Bicoys know how to set a spread. 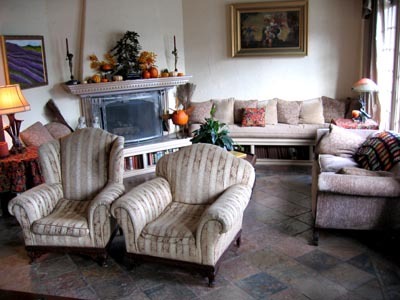 The sitting room at Eiler’s Inn where you can relax with a fireplace, comfy chairs and they have a TV to watch. There are no TVs in the room which is actually quite nice. It’s a B&B and not a hotel so it’s a place to relax and hang out. 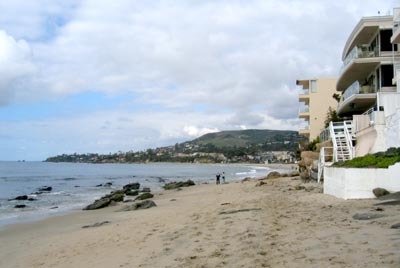 I had to check out the beach and the Inn is only a stone’s throw away, one set of set of houses back from the beach. 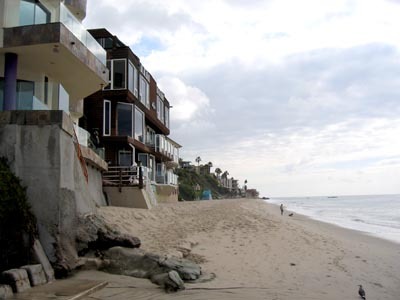 This is the walkway down to the beach. On the beach looking north. On the beach looking south. This time of year it’s starting to turn cold so nobody was in the water, though one of the other guests at the inn went swimming. 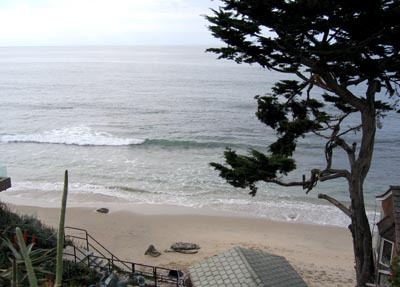 The south side is supposed to be pretty good for surfing. Chaz up on the sun deck. Notice how short his hair is due to a self haircut experiment gone awry. 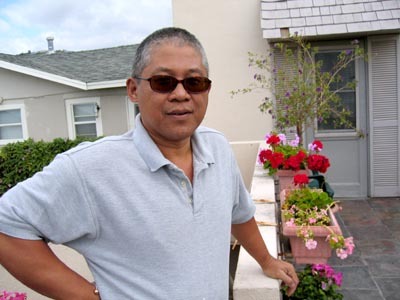 Apparently he bought some kind of home haircut kit and Linda gave him a nice haircut. Then he noticed there was a shorter cutting attachment and while Linda was gone he tried it out on just the side of his head but it mowed across leaving a very short section so he later told Linda to just buzz the rest of his head to match. This is after his hair has grown back a bit, he said it turned out to be the attachment for the shortest buzz cut in the kit.